This weekend will see more than 400 landmarks in more than 50 countries go green for St Patrick. 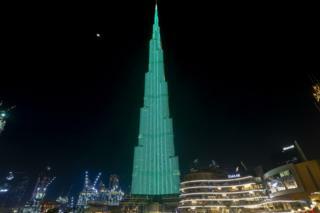 The annual Global Greening initiative by Tourism Ireland started in 2010 and topping this year’s new additions list is the Burj Khalifa in Dubai -the world’s tallest building. Victoria Falls in southern Africa and Lord’s cricket ground in London are also among the 2019 newbies. Image caption Is it St Patrick’s Day in Las Vegas? You bet!